I have spent much of the winter keeping a mental record of things that are poky here. There’s a lot of ’em. First are the natural offenders. Blackberry brambles are quite poky, but they’re enormous and visible from a distance, so I can avoid them. We also have “witaba trees” (name that movie!). We call them that for two reasons: First because it is winter, so we have no idea what kind of tree they are. Second, because they have a shocking amount of thorns, which increase in size according to the size of branch they are on. The big branches have 3 inch thorns, but it’s the little ones that reach out to trap you. They cling to clothes, hair and skin in a remarkably poky way that has me yelling for Adam to untangle me. You’d think I could avoid a tree, but there is a lot of brush here, and some of them are very small trees. Perhaps it’s my own carelessness that gets me trapped by thorn trees, but the rosbushes are conciously trying to get me. I’m sure in June I’m going to be all “there are roses everywhere! How lovely!” But right now there are leafless wild rose stems everywhere, and I can’t walk thru the grass without them grabbing my jeans and shoes and sleve cuffs. I’m getting poked and tripped. They don’t grow as bushes until they’re really quite large, but are just single strands of viny rose mixed in with all the other knee-deep vegetation. I’ve gotten so unless I’m bleeding, I just rip myself free and move on. The other thing that lies hidden in the deep grass is barbed wire. This place has clearly been occupied for a long time, but no one has ever removed old fencing, they’ve just put up more fencing in new places. Back at our “dump” there are rolls of the stuff, but it is also strewn all over the property and grown over. If we live here for 30 years, which I hope to at the least, we will still be finding it by tripping over it. Last, but certainly not least is the glass. It’s everywhere. A house burned down, and all its windows are now curly, blackened, wickedly sharp shards that lie mostly in heaps. This kind of makes sense, but it seems that daily I find broken glass while rambling through the woods. I planted out garlic, using some topsoil to fill the pot,and had to pause to pick bits of glass out of it. Then a bit got stuck down in the finger of my glove. Later I discovered daffodills around the old house and was clearing the grass away when I felt a sudden pain in my knee and saw that i was bleeding through my jeans. The old front window was in a blackened heap- once again hidden by the grass. But that’s not the worst of it. Adam accidentally broke the little window in our door, slicing his hand badly and requiring 24 stitches! It was Quite Horrid. Shards were everywhere. 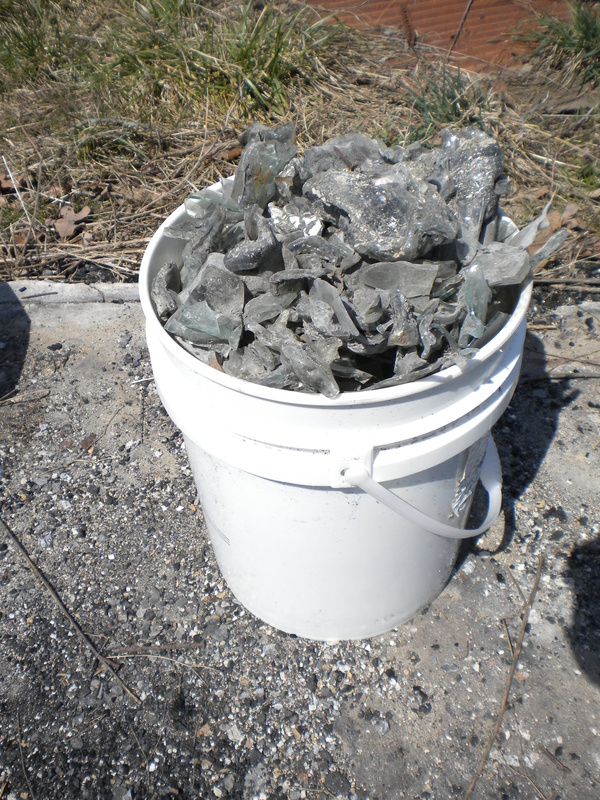 The next day I carried a bucket around and picked up more than 5 gallons of broken glass. And that’s just around the old house. Now that it’s warming up, I’m so tempted to go around barefoot, But I’m pretty sure it’s not safe yet. Or at least that my feet aren’t toughened up enough yet.